Pardonnez-Moi... Can You Name The French Words Used in English? The French Words Used in English? Ooh la la! La France is closer than you think. Can you name the French words used in English in this charming little word guessing game? This French word guessing game is just perfect for International themed parties! Add some joie de vivre to your party, and break the ice with this cute little game. Following an entertaining performance, the unceassing applause of the appreciative audience is a request for an...? 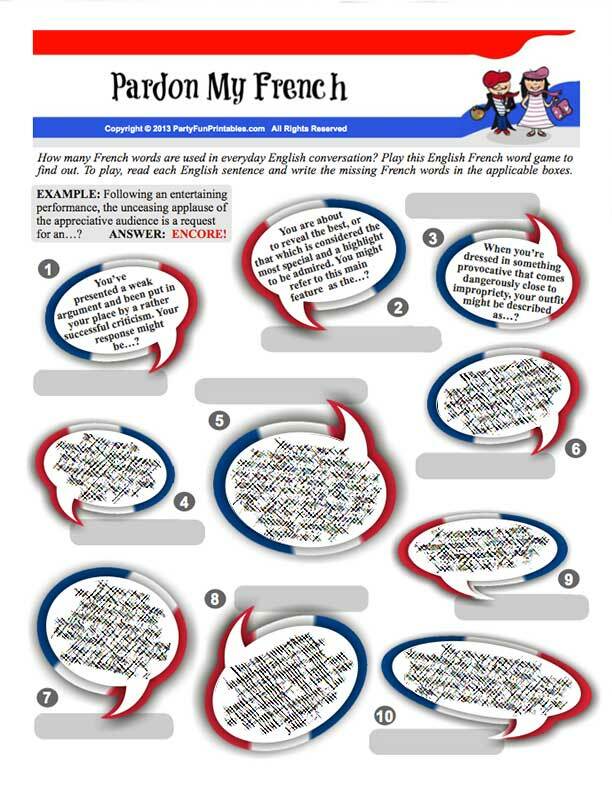 How it's played: Players read the descriptions of the French words that are used in English, and fill in the correct answer. The player with the most correct answers wins. Preparations are easy: Just print out as many sheets as you need. Play some French chansons in the background to add to the atmosphere, and serve with Hors d'Oevres!